Historical Highlights | HACIENDA HEIGHTS IMPROVEMENT ASSOCIATION, INC.
1960-A preliminary Master Plan of land use was drafted by North Whittier Heights Association. 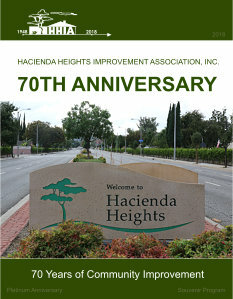 1962-The local community was renamed Hacienda Heights. 1970-Palm trees on Hacienda Boulevard were planted; HHIA still opposes the removal of these trees. 1972-HHIA’s 25th Anniversary event was held at the California Country Club, Bud Welch was the Master of Ceremony. 1973-Ruth Dryden is named HHIA’s first woman president. The Hacienda Heights Master Plan for Land Use was adopted and was in force for 37 years. 1978-Cityhood effort, led by Tag Manning, was forfeited under a cloud of corruption. 1979-LA County Sanitation District announced expansion of Puente Hills Landfill. HHIA initiated the “Dump the Dump” group with Jim Stagner named as Chair. 1980-HHIA worked with AQMD on projects, including QEMETCO & emission standard violations from the dump. HHIA organized meeting at Orange Grove School regarding a buffer of 200 feet of landfill from homes. 1981-An Additional 151 acres were added to the landfill, for a total of 1,365 acres, the largest in the U.S. The Citizens Advisory Committee (CAC) was formed by LA County Sanitation District as part of the EIR process for the planned expansion of Puente Hills Dump. HHIA representatives, Wil Baca, Bob Isaacson, Jeff Yann, Jim Stagner and Millie Hank were founders of the CAC. 1982-The first reverse vending machine (aluminum cans into cash) in San Gabriel Valley at Alpha Beta on Hacienda & Colima, led to mandatory recycling, increasing in volume each year. Hacienda Heights began curb-side recycling, which became law in Sacramento led by Wil Baca, Jim Stagner & Supervisor Schabarum. 1983-There were nine candidates running for the HHIA board, the four winners were: Wil Baca, Wil Briesemeister, Sandy Johnson & Jim Stagner. More than 1,000 residents filled Los Altos gymnasium for a “Dump the Dump” hearing by LA County Sanitation District & Senator Bill Campbell about continuing expansion of Puente Hills Landfill. Jeff Yann & Wil Baca met with LA County Sanitation District and LA County supervisor to place permanent restrictions of dump fill in two Hacienda Heights canyons and to fight for dump closure by 1993. 1984-3,000 questionnaires, mailed to Hacienda Heights residents by Wil Baca, Membership Chair, resulted in the HHIA’s doubling the members to 1,000. 1985-A Town Meeting was held at Newton Jr. High, on August 8, covering the topics of Waste-to-Energy at Puente Hills Dump and the proposed Cityhood procedure to gather signatures. A Town Meeting regarding “Water Pollution Disaster” was held at Los Altos High gymnasium on October 9, and drew over 1,000 residents. President Jim Stagner formed a water quality a committee. 1986-HHIA won a week-long court case against LA County Sanitation District to permit two mass-burn incinerators at Puente Hills Landfill. Wil Baca, founder of Citizens Against Dumps in Residential Environments testified against the trash incinerators. On September 25, ’86, California Energy Commission ordered Sanitation District to halt the installation of the two trash incinerators. 1987-“At Issue”, a Sunday half-hour television show, featured an episode on waste-to-energy plants and interviewed Wil Baca, HHIA Environmental Director. Thousands of cubic yards of roadway demolition and oil waste on south end of 7th Ave. was reported to the press by Barbara Fish & Wil Baca. The District Attorney’s Toxic Strike Force had the debris removed and Health Department found contaminated ground water. 1988-Barbara Fish, HHIA president started plans for the first Hacienda Heights 4th of July Parade, in May. The HHIA parade committee included: Nancy Abbott, Sara Barnes, Jean Baca, Louise Martin, Jeanne Thiessen, Carol Mauceri, Steve Feld, Bud Welch, Bill Lynch, Judy Willett, Jim Beaker. Kiwanis became the parade sponsor.. Hsi Lai Temple was in the process of construction. Eight HH leaders: Norman Hsu, Wil Baca, Jean Baca, Louise Martin, Peggy Smyth, Alice Anderson, Candice Larsen & Cable cameraman were guests of the temple in Taiwan for tour of temples, schools, environmental exhibits and a TV studio. Hsi Lai Temple’s inauguration ceremony was celebrated on November 26. Sally Bianco led the replacement of wooden telephone poles with underground lighting on Hacienda Blvd. 1989-Hsi Lai Temple held its first annual Neighborhood Party featuring workshops, information, entertainment, dinner and gifts. International Cultural Association was formed by Norman Hsu. HHIA board members, Barbara Fish and Wil Baca were part of Task Force to find alternatives to landfills. Curbside recycling began in Hacienda Heights. HHIA produced a video featuring HH and its leaders, “Growing with Pride”. Barbara Fish and Jeanie Thiessen testified to LA County about hill erosion. HHIA’s By-Laws were revised. 1990-Visual impact of bulldozing of local hills for dump expansion shocked residents. Gang Awareness Seminar was held at Mesa Robles School. HHIA joined other San Gabriel Valley cities to stop Medfly Malathion spraying. 1991-Draft order was received by HHIA regarding the disposition of 14.00 tons monthly of untreated ash in Puente Hills Landfill. $90,000 was raised for court fees against dump. Resident’s signatures were collected by volunteers with Wil Baca, Jean Baca, Norman Hsu, gathering the majority needed to place the item on the June 1992 ballot. 1992-Jeff Yann, HHIA representative to CAC had 3 special meetings with SANDIST, “Battle of the Canyons”. Jeff and members of Edison’s engineering staff met with Sanitation District to encourage their participation in Edison’s clean Waste-to-Energy Gasification – a technology that could make landfills unnecessary. Water Committee sought an injunction against hazardous ash, 14,000 tons dumped monthly. Wil Baca and Barbara Fish joined Senator Estaban Torres to testify at State Water Quality hearing. Senator Art Torres presented the “Clean Can” award from the Coalition for Clean Air, to HHIA representative Wil Baca, a Board Member of Coalition for Clean Air. HHIA’s lawyers, Bob Manuele & Raul Sahagun won a Refional Water Board ruling for a Class II identifier and ruled that all Hacienda Heights canyons by Class III, not allowing toxics Faced with opposition from HHIA, Sanitation District proposed a $1 per ton surcharge that generated $75 million for land acquisition in Puente-Chino Hills Wildlife Corridor in and near Hacienda Heights. EIR was overturned due to water quality, leaking from barriers and liners. LA County restricted land filling within 2,000 feet of homes. Native Habitat Preservation Authority was formed with HHIA. The quest for Cityhood was led by Wil Baca, Wil Briesemeister, Jim Baker, Nancy Abbott, Gloria Nunes and 32 other leaders. Wil Baca was slated for mayor with Charles House, George Hensel, Eugene Chang, & Cecelia Yu as the City Council. Cityhood lost by less than 1%. 1993-HHIA submitted a grant application, completed by Jeff Yann & John Shubin, to develop a new trail loop through canyons planned for future land filling. County included a landfill fee to compensate property owners for loss of value to their property for living near the largest landfill in the US, whose permit was to expire in this year, plus a $1 per ton charge which has been used to purchase thousands of acres of lands in Puente Hills to compensate for loss of 100 acres of Hacienda Heights canyons as a result of landfill expansions. Graffiti removal continued successfully thanks to Code Enforcement Director Rudy Almeida. Supervisor Dana proposed a 25 million ton dump expansion. Conditional Use Permit hearing at Board of Supervisors for Puente Hills Landfill expansion had HHIA speakers: Jeff Yann, Dave Johns, Marian Manuele, Steve Feld, Carol Mauceri, Bob Isaacson, John Shubin & Barbara Fish. HHIA fireworks stand run by Claude Rumph, Nancy Abbott & Dave Risser raised $11,400 for legal battle against the dump. 1994-The Puente Hills Native Habitat Authority was formed by Joint Powers Authority with Dr. Wayne Huang as delegate. Andrea Gullo & Barbara Fish were major founders. HHIA connected homeowners impacted by the landfill with attorneys, who won a $3 million settlement from CSD. 1995-Jim Davis Beautification Day, the Saturday before the 4th of July Parade, began with President Jim Davis; volunteers clean streets on and near Stimson. 1996-Powder Canyon, 517 acres in La Habra Heights, and 63 acres at the top of Seventh Ave. were purchased by Native Habitat Authority. HHIA’s objection to the Pacific Heights Project, 114 acres proposed for 50 homes on 10 acres at Apple Creek Lane with 76 acres preserved as open space and 28 acres as man-made space began a 16-year objection list from HHIA, including unacceptable disturbance of oaks, alteration of topography to cause slope failures, homes in high fire location, few escape routes, and traffic impacts on Dawn Haven and Colima Rd. 1997-George Hensel, through Mountains Recreation Conservation, donated a Wildlife Watering Station (Guzzler) at the west end of Skyline Drive. HHIA’s testimony before State Water & Regional Boards resulted in the reduction of contaminated ground water from the landfill into San Gabriel River drinking water aquifer. HHIA researched health impacts from escaping gases. Native Habitat Authority purchased 62 acres above Seventh Ave. and two new recreational trailheads were designed for hikers and equestrians. The Habitat Authority approved a proposal by Jeff Yann to construct new trails in Coyote and Tonner Canyons. The trails were constructed by the California Conservation Corps. 1998-Three Storm Drain Projects began on Pontenova Ave, Hacienda Blvd. and the frontage road along south side of Gale, replacing 51 inch with 84 inch pipe, to eliminate curb-to-curb storm water accumulation on Gale. Steinmetz Park Senior Center’s preliminary design was completed by LA County planners. 1999-James Davis, former president and treasurer resigned due to health issues. LA County Sanitation District removed trees and cut down ridge lines due to slope instability for expanding the dump. Hills for Everyone – Friends of the Wildlife Corridor, dedicated to protecting this open space and to protect wildlife and recreation opportunities near Puente-Chino Hills, was formed. 972 acres of hillside above Vallecito Drive, owned by Rose Hills Cemetery, was purchased by Native Habitat Joint Powers Authority and was the last major piece required to maintain open space preserve in west Puente Hills. 2000-The Steinmetz Senior Center’s, located at Steinmetz Park was completed and features activities for 55+ residents. The facility is operated by LA County Department of Parks & Recreation. Three new areas near Hacienda Heights and all of the Puente/Chino Hills Wildlife Corridor were named as Significant Ecological Areas. Southern California Association of Governments (SCAG) designated a Truck Lane Task Force to study adding sound walls, four additional truck lanes, possible double-decking Pomona Freeway between Long Beach Freeway & Interstate 15 in Ontario. Barbara Fish, Jim Snyder & Jeff Yann proposed to SCAG a San Jose Creek routing to bypass Hacienda Heights, Rowland Heights and Diamond Bar, constructing lanes through industrial areas. The cities of Diamond Bar and Walnut later convinced SCAG to have the truckway run through their cities. 2001-Medians on Hacienda Blvd. between Gale Ave. & Richview Dr. included 12-inch curbs replaced the 4-inch were paved with stamped concrete, plus crepe myrtle and fern pine trees were planted between Three Palms and La Monde. Draft EIR of the Dump expansion was allowed a year of additional processing time. Landfill activity operated for a year while EIR was being revised to correct deficiencies identified by HHIA and the CAC. HHIA supports four State Bills which added recycling, restricts landfills near drinking water, and reduce threats to animals across the Wildlife Corridor. Jeff Yann, HHIA’s representative to CAC, and members of landfill committee had three special meetings with the LA County Sanitation District and elected leaders’ representatives. As a result, LA County received an additional $1 per ton included in Conditional Use Permit for community enhancements in Hacienda and Avocado Heights. Native trees & shrubs were planted on local cut slopes. 2002-Barbara Fish, Jim Snyder, Jeff Yann testified to Southern California Association of Governments (SCAG) about alternate routes for a dedicated truck roadway along or above Pomona Fwy. and lobbied for sound walls along 60 Fwy. Joint Powers Authority/ Puente Hills Native Habitat Authority purchased 951 acres of undeveloped wilderness, Turnbull & Worsham Canyon property from Rose Hills Cemetery, which connects Ford & Seventh St. properties. Canyons 6, 7, and 8, with wilderness in Whittier and La Habra Heights, are now part of 4,000 acre Puente Hills Wilderness. LA County required the collection of $24 million from landfill tipping fees to be used for betterment of Hacienda Heights residents located near the dump. Firm closure of the Puente Hills Landfill was declared, no later than 2013. Shell Oil Aera proposed 2,600 dwellings, a sports stadium and a 200,000 square foot commercial complex on the hills near the 60 and 57 freeways. Rowland Heights, Hacienda Heights and Walnut strongly opposed the project. Postcards of protest were sent by hundreds of residents to Shell Oil Aera. A HHIA 3-fold informational brochure was proposed and designed by Chris Kakimi. 2003-Hacienda Heights quest Cityhood was launched by Barbara Fish. Mike Williams was declared chairman of the Citizens for Cityhood, Barbara Fish as vice chair, Stan Barlow as treasurer, Diana Wood as secretary, Jeff Yann as education chair, Jean Robson as fundraising chair, plus 30 active members. A phone bank was activated in a Hacienda Heights real estate office on Azusa. Cityhood lost by 63%. http://www.hhia.net web site was formed by Craig Norris and Rick Lacy. HHIA opposed the Hill Bros. Ammonia facility. Mary Varela, Jeff Yann, John Shubin, and Nancy Abbott proposed to school district developing vacant portion of Orange Grove Middle School into a park. 15 local churches participated in the Cold Weather Shelter program. Mike Hughes requested conservation easement for open space land outside landfill’s operating footprint. 2004-Conditional Use Permit established a Community Benefit & Environmental Education Fund to provide resources for environmental & educational programs primarily to benefit Hacienda Heights. “On the Edge, People & Wildlife Program” co-sponsored by Puente Hills Native Habitat Preservation Authority, featured wild animals found in the Hacienda Heights hills and promoted the understanding of the value of wildlife and habitat. Conversion Technologies Advisory Committee, required by CUP for landfill expansion, was formed, with Jeff Yan representing the HHIA. Jeff Yan also represented HHIA in the Hillside Open Space Education Committee (HOSEC) formed this year. The first Taste of the Heights was held on May 27 at Pathfinder Park in Rowland Heights. Brian Sanford was named the new “Town Sheriff”. 2005-LA Supervisor Knabe’s Hacienda Heights & Rowland Heights Community Connection resource guides first annual edition was mailed to all residents. On September 22, Native Habitat Preservation Authority held its grand opening of Seventh & Orange Grove Trailhead after nearly 18 years of planning. Massive ornamental iron gates, designed by three Los Altos High School students, were erected. A glass-enclosed sign and map, plus restrooms and a drinking fountain greet visitors at the entrance to the trails. The LA County Sanitation District offered a tour of the Water Reclamation & Materials Recovery Facilities, recently in operation. HHIA celebrates its 50th Anniversary of incorporation. Hero badges were awarded to 64 deserving heroes! 2006-Airsoft, toy store near Von’s sold real weapon replicas; HHIA helped to have it closed. A public meeting regarding Quemetco, a battery recycling facility on 7th Ave., was held at Stimson Learning Center, to discuss cancer risks. The Community Planning Advisory Group, led by Jeffrey Lambert and Anne McIntosh, held a kick-off meeting at the Steinmetz Senior Center. Dedication of Harbor Boulevard underpass for wildlife safety was celebrated. Supervisor Knabe’s Town Hall Meeting at the Hsi Lai Temple drew 60 residents. Also in attendance was Supervisor Knabe, 15 L.A.County departments and 40 Law Enforcement officers. 2007-The “Welcome to Hacienda Heights” signs redesigned and replaced. The HHIA bulletin board near the post office was refurbished by Donna Steinmetz. An electric reader board at Hacienda Blvd. and Halliburton was installed by Supervisor Knabe. Neighborhood Watch and Landfill Tipping Fund community meeting at Steinmetz Senior Center attracted a large crowd. Construction began on Pomona Freeway’s High Occupancy Vehicle (HOV) lane, as well as a 4-year sound wall project. First public comment meeting on Shell-Aera’s 3,600 unit proposed housing project across the hills from 57 Freeway to Fullerton Road, which would destroy the wildlife habitat, was held in Diamond Bar. HHIA won a trophy for its 4th of July Parade entry. Banners honoring those in service were placed on light poles throughout Hacienda Heights. 2008-HHIA’s 60th Anniversary of its formation held its First Annual Dinner Meeting, at Steinmetz Senior Center. Plaques and certificates were presented by Dickie Simmons and Jean Robson to termed-out six-year Directors, Charles Norris & Mary Tang. HHIA submitted comments on the Draft Annual Report for the Puente Hills Landfill and a letter of thanks to the county’s Regional Planning for their work on the Hacienda Heights Community Plan report. Rowland Heights proposed Cityhood, the boundaries would run west from Bank of America on Pepper Brook, south on Manor Gate, west on Colima, south on Countrywood, east on Royal View into hills. Rowland Heights could include all of Hacienda Heights and any surrounding unincorporated area within their city boundary. City of Diamond Bar wants to annex 3000 acres of Rowland Heights hills for the Aera Shell project to build 3600 homes and business complex. As a result of the efforts of Barbara Fish, Jim Snyder and Michael Hughes, SCAG eliminated the Pomona Freeway as dedicated truck lane route and as a terminus of Long Beach Freeway truck lanes. 2009-HHIA’s 61st Anniversary Second Annual Dinner Meeting was again held at Steinmetz Senior Center, Jean Robson chaired the event. The program included the history of HHIA from 1947 to 2009 and past Boards of Directors. Retiring 5-Year Director Scott Martin was presented with a plaque from HHIA and a certificate from Supervisor Knabe. A new tradition was started, Certificate of Merit Awards, given by Supervisor Knabe & Congresswoman Napolitano was presented to local heroes. Holmes Circle residents attended LA County hearing and halted proposed cell tower. HHIA sent the LA County Sanitation District a letter regarding the delay in meeting the third milestone of its CUP to have a fully operational waste by rail system which could be an indication of a future inability to close the landfill on the in November 2013. 2010-HHIA’s 62nd Anniversary Third Annual Dinner Meeting, held 83 guests at Steimentz Senior Center, on January 15th. Jean Robson, termed-out six-year board member. Certificate of Merit Awards were presented to Barbara Fish (post mortem) and Jeffrey Yann, who have dedicated more than 30 years to Hacienda Heights. On July 3rd a Rededication of Hacienda Heights Trailhead in honor of Barbara Lee Fish, Barbara’s plaque was embedded in a special rock at the Trailhead entrance. Maury Edwards heads the Jim Davis Beautification Day, cleaning several streets for the 4th of July Parade. The 2010 Census “You Count” committee headed by Rick Kozak for communities & Adria Ybarra for HHIA went door-to-door delivering census information. Committee members included: Mike Hughes, Mauri Edwards, Mae Chu, Jim Snyder, Chris and Diane Kakimi. 2011-HHIA’s 63rd Anniversary Fourth Annual Dinner, held on January 14th, greeted over 80 guests. President John Eckman presented a plaque & Dickie Simmons a certificate to termed-out directors Michael Hughes (served 14 years total), and James Snyder (served 12 years total) both termed-out twice. Certificate of Merit Awards were presented to Rudy Almeida & Lillian Avery’s son Mark. (Lillian was told of her honor just before she passed away.) Both have dedicated over 30 years to Hacienda Heights. At the conclusion of many community workshops and meetings, the Hacienda Heights Community Plan was adopted on May 24th, replaced outdated plan of 1978. HHIA’s 4th of July parade entry won First Place. Redistricting from the 2010 Census resulted in Supervisor Don Knabe remaining in the 4th District, after many letters, e-mail, calls and testimony from residents.